This third powwow by the revered behemoth of percussions and drums Z'EV and surprising duo of young Polish percussionists Rafal Iwanski & Rafal Kolacki, better known as Hati (named after the mythological wolf that chases the Moon according to Norse Gylfaginning? ), sounds like the title "Collusion" seems to suggest for a couple of reasons: on one side, their skills perfectly matches and such a mutuality shines through the five acts of this recording, on the other side, their somewhat transcendent percussive textures and thick amalgam of harmonic auscultation evoke menacing harbingers and a deeply trance-inducing ritualism, so that their point of convergence doesn't lie only on vocational and technical aspects, but also conceptual or I'd rather say neural. It's just something they do together, as a male voice (Z'EV's one) stigmatizes before the performes start to play. Such a statement could sound a little bit self-referential, but the mesmerizing heights they climb by means of weaves of gongs, tolling hits, rubbing of membranes, grimly clashing cymbals, slightly ominous tom-tomming, spatialized plucks over the five parts of Collusion" titillate listener's imagination and wrap it by a sort of electrified cloud. Both Z'EV and Hati move deftly in the field of ritual trance music and its ancestral structures, even if their percussive journey, the gradual unfolding of hypnotical beats and contemplative undertows definitively sound like the outcome of possessed improvisational sessions whose absorbing progression could let you think about geometrical figures which asymptotically tend to a perfect circle. New full-blooded streams of fused silica on Heath Looney's label Pushing Red comes from proficient German producer Martin Heinze aka Martsman, who cajoles bass music lovers with a couple of brilliant tracks by this cookie. The amazing "Shrank" falls into the temptation of a sort of sophistication of 90ies garage-step which spreads over a shaped synth-pad before the percussive pillar begins to grind on subtle sounds and and dry up, while on the flipside the initial thin flurry on a mechanical bombard on "NYCD" evolves into a poisonous headbanging techstep, where Martin injects suctioned square waves, spongy basslines and delayed squeak from a rudimentary theremin and radio bleeps. Another sonic gem from this surprising label where a listening needle is going to get threaded. 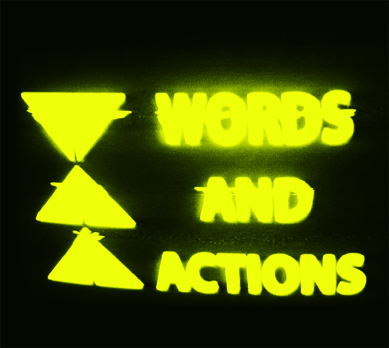 Coming from Alessandria, Italy, Words And Actions are a duo that in the last couple of years released two tapes (one album and a mini) and a video EP (you can check all the videos at their youtube channel http://www.youtube.com/user/cantfeelmyflesh). They recalled me some Italian bands I knew in the 80s (L.A.S. 's Crime that had a compilation of their stuff recently reissued and Thanatou Melos), a bit of DAF as well as nowadays bands that are influenced by those sounds (Martian Canterel, Staccato Du Mal, to name a few). "Time Can't Be Turned Back", issued by Final Muzik, is the first CD release by the duo and it gathers all the tracks from the two EPs ("Life Of Farewells" and "Imperfection") plus six out of ten from the album "Can't Feel". The tracks tend to mix few melodic elements (usually two or three catchy synth lines are alternated) with obsessive drumming and bass lines (they use long distorted synth lines) with the add of filtered cold vocals. Unfortunately I can't tell you more about the project, because also their website is kinda focused on few visual elements which remember me the solarization effect used on early 80s videos. Even if the sound and the visual are deeply linked to the 80s I can't tell that Words And Actions gave me the feeling to be mere revivalist. I think that their fascination isn't fake because if you check on their youtube channel the short video of a live they did at Ligera in Milan about a month ago, you can understand what I'm trying to say as they are able to create a dark atmosphere with few synth lines without sounding naive. It's like they are turning their influences into something new without being poseurs. Anyway, I enjoyed this compilation and it's worth your attention if you dig 80s cold wave. This appetizer by Manchester-based producer Sam Walton is going to mouthwater the eardrums of many followers of the renowned Hyperdub label and its stable of beat-bucking nags and colts with a penchant for unusual compositional logic, as usual. It precedes the already announced release of his very first album "Beyond" and sets the stage by a coulple of amazing tracks: "Baby" has been built around an R'n'B acappella and bumping crackles of kick and snare drums, which sounds like enliven a proper construction site or supposedly a joiner's workshop as suggested by the tapping jam of noises of engines, hacksaws, alembics, gearwheels and so on, as if Walton discovered a "workbench" dimension and an inner savage order for R'n'b. After this bizarre (but really amazing) declension, which comes with an instrumental version, "Can't You See" increases salivation and appetite by hanging a billowing pad-synth over goading twists of bumping basses, dry snares and whirling 8-bits whetstones. Even if it's a strictly limited appetizer, "Baby" is a very efficacious teaser and a proper exhortation to move beyond. All those ones who remembers the first steps by Canadian musician Michael Morton aka Displacer on M-Tronic maybe will discern that his futuristic touch, which previously embellished ambient and downtempo-oriented stuff, has not perished even within the beat-thickening amazing muddle he flaunts on this tidbit, which comes on his own resurrected imprint Crime League. In spite of the solid rhythmical mould, which could remind some Beefcake's tunes or Gridlock's geometries by means of its mindblowing oscillations between IDM, breakbeat, drum'n'bass and analogue greasy sonorities, the four tracks and the remix on "The Curse Of The Black Lotus" exude whispering hues of the primordial sonic approach, which manages to carpet sounds with a charming air of mistery and a touch of electronic vintage: for instance, the whirling swishes of "Black Sun, Black Moon" starts and and develops around an hypnotic buzz which could recall the one Underworld widely used on some old tracks such as "Rez" or "Cow Girl" over a breakbeat carburetor, which could evoke some old stuff by Prodigy, the initial ignition on "Black Lotus" could be easily mixed both with some borderline tune by Proem and funked-up sci-fi breakbeat which some djs used to play 10-12 years ago and the scrampling airborne smoothness of Burned Mix of "RZLA" could activate some listener's aural memories related to some legendary moments of "space-odissey" techno age (Cyrus, Two Lone Swordsmen, CJ Bolland or Kevin Saunderson), but the casting of fused silica, post-industrial contrivance and "orchestral" charred coats by Displacer glow each track in a very charming way. It seems that Displacer is going to put a spell (or maybe a curse which will not easily get disabled) on a somehow groping scene.